I know what they think, some folks anyway. They say I’m a difficult person, and that I’m hard to get along with. Those folks are probably the ones who don’t want to hear the truth, or the truth as I see it. My daughter, Edna, tells me to think before I speak. I do. I think a lot. And then I tell people exactly what I think. Unfortunately, some folks don’t want to hear it. And I do have friends. I’ve known Marsha since grade school. We write letters to each other only once or twice a year, but we’re still friends. Marsha called me this morning. “Dora! Something terrible has happened at Cloverleaf High. It's a crime!!" "What?" The captain of the football team had aged during the past forty-some years, along with the rest of us? Cloverleaf High was built about the same time as the Pennsylvania Turnpike, and overlooked one of the first cloverleaf intersections in America. This was a source of pride to the powers-that-were. I decided not to argue with her about that. Maybe, in a way, I like being impossible. What hobbies did you learn from your grandparents? Janet Bolin is the author of the THREAD AND BURIED, THREADED FOR TROUBLE, DIRE THREADS, and NIGHT OF THE LIVING THREAD. You can read about how |Mrs. 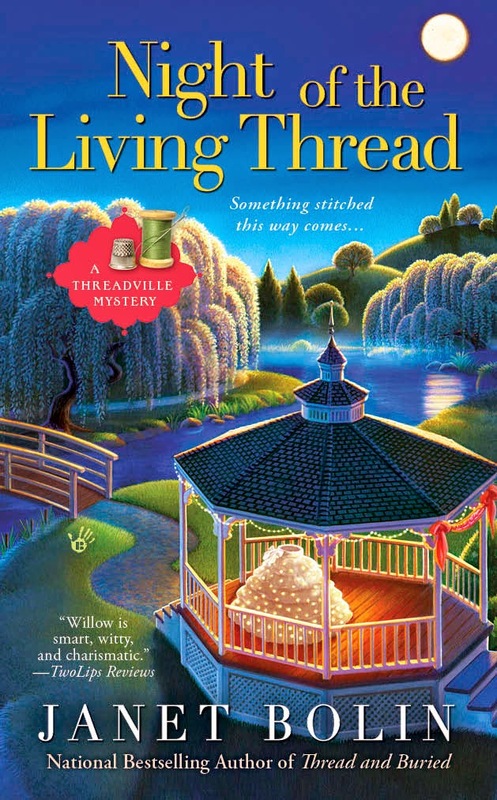 Battersby helps Willow follow an undulating trail of glow-in-the-dark thread, unravel ancient Egyptian curses, and creep through a haunted graveyard to unearth a killer in NIGHT OF THE LIVING THREAD, available at these booksellers. Read the first chapter here. I love this series. I have the new book on my kindle. I am waiting to read it around Halloween. Home Ec is where you learn to make tuna caserole. And toast. They let me make toast. I burned the tuna casserole. The toast, too, come to think of it. Me too, Zita. I managed to squeak by with the cooking.